Jim Coldwell is a City of Hull AC runner and a member of CrossFit Hull. 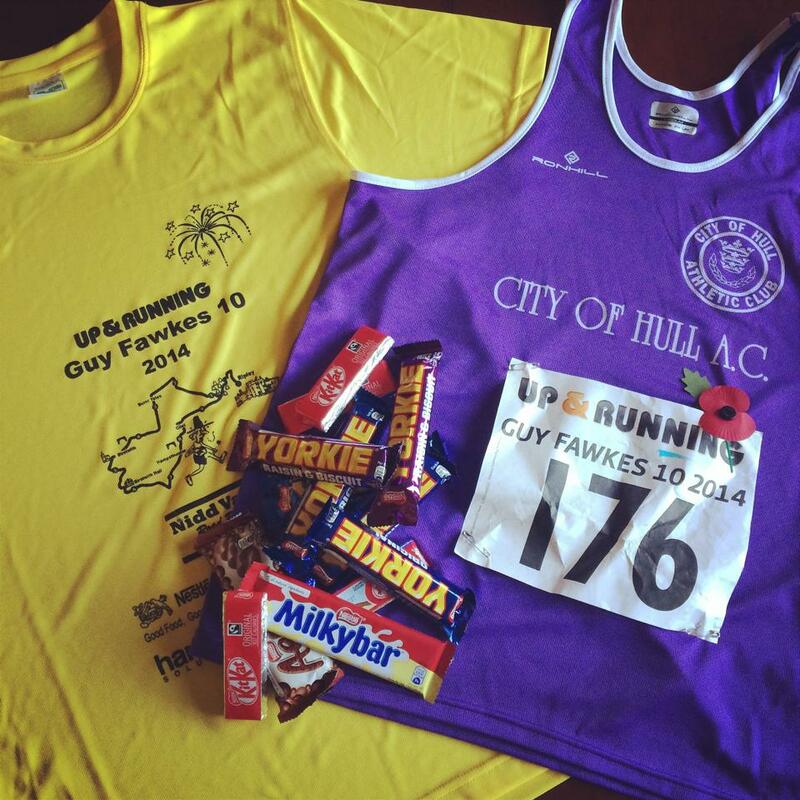 Remember, remember, six Yorkie bars, four KitKats, an Aero and a Milky Bar wait for you at the finish. I had heard the Guy Fawkes 10 was a tough, hilly, we-don’t-have-hills-like-these-in-Hull kind of race – ideal for my first competitive race back from injury then. This was my first race representing City of Hull AC (CoH) since joining the club a few months before. 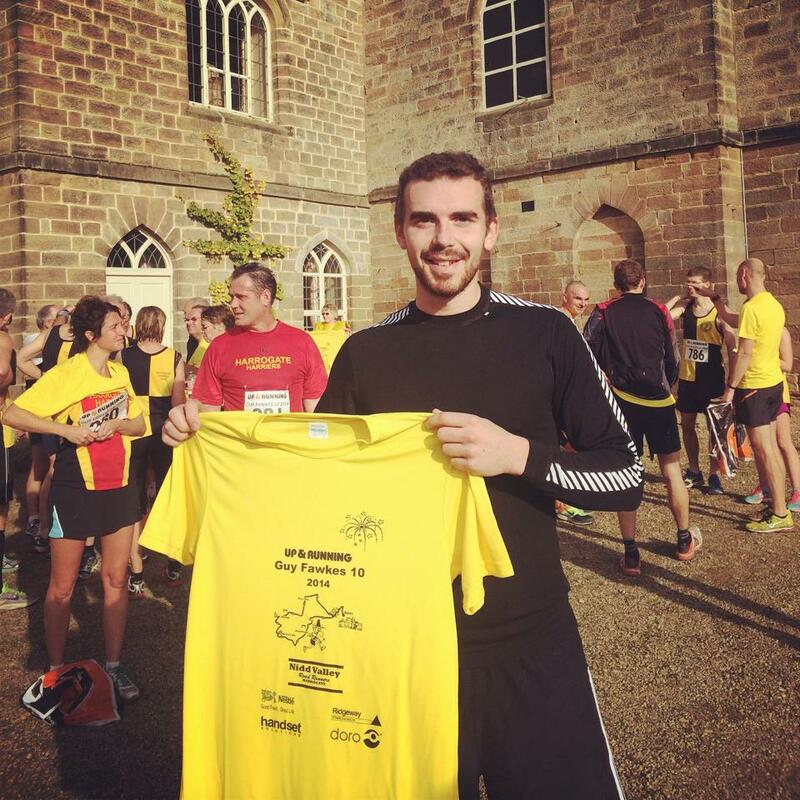 Training with CoH as well as attending weekly track sessions had an instant impact on my running – I ran a PB at the Vale of York half marathon by four and a half minutes. The evident improvements made the frustration of being struck down with tendonitis just the week after even more frustrating. As any runner would tell you, putting your feet up for a few weeks is as challenging as completing a race, irrespective of distance. But, reluctantly, rest I did and I was fit and raring to go on race day. Anyway, with it starting and finishing in Ripley, North Yorkshire – just a stone’s throw away from my hometown of Knaresborough – and safe in the knowledge that there would be the mother’s Sunday roast waiting for me after, I would have been hard pressed to convince myself to withdraw even if the injury hadn’t subsided. I am definitely a runner that enjoys the smaller, club organised races compared to the larger, more commercial, mass participation ones – not to say there is anything wrong with those, of course. But, you get the feeling the former are organised by people who care about runners’ experiences, not just the state of their cheque book. Guy Fawkes 10, organised by Nidd Valley Road Runners, is the epitome of this. For a measly entry of £12, you get an extremely organised event from start to finish – ample parking, efficient race number collection, a well marshalled course, two drinks stations and every runner’s real reason for racing, a well-stocked goodie bag and a t-shirt! And the positives don’t stop there. 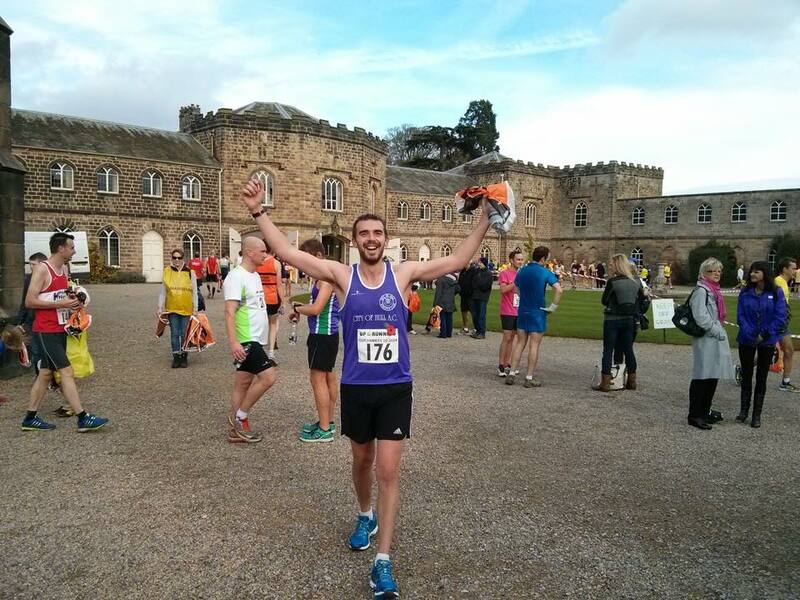 The start is in the shadow of the stunning Ripley Castle, the finish in the courtyard of the castle, the three climbs are quirkily named – Birstwith Brute, Swincliffe Swine and For Fawkes Sake (enter and you’ll find this is aptly named) and the scenery along the route is stunning. So, what’s the course like? The first mile and a half is slow as the route is narrow and mix of Tarmac and trail. Once this part has been safely negotiated, the race opens out. A couple of steady climbs takes you to Burnt Yates before dropping down Clint Hill into Birstwith. Around mile four, the first of the three main climbs falls. Birstwith Brute is a steep ascent but relatively short, around 300m. The remainder of the first half of the race is a steady descent, a perfect chance to recover from the Brute! The respite doesn’t last long though as, around mile seven, you are faced with Swincliffe Swine. Again, not a long climb but sharp and breath-taking. Recovery this time isn’t as easy as your legs tire, although the stretch through Hampsthwaite and over the river helps to take your mind off that. Now, the finish line is in sight, just over another hill! At mile eight, For Fawkes Sake kicks in. For me, the toughest of the climbs. Winding up a narrow country road for around 400m, the name couldn’t sum up every runner’s feelings better. After conquering the final main climb, it’s time to release the handbrake and let the legs take you where they want – you’ll have no choice, trust me. From the outset, the Guy Fawkes 10 felt like a proper runner’s race. And the finish emphasised just that. With just 200m to go, one last challenge awaits – a sharp 100m climb right to the tape. If you didn’t enjoy running, if you didn’t understand the challenges that every runner faces in each race, irrespective of distance, and if all that went before you at this race wasn’t to the standard it was, you could be forgiven for thinking this was a cheap shot from the organisers. However, despite my legs being ridden with lactic acid, it brought an approving smile to my face! Crossing the line in a time of 1:13:20 and with a negative split of just over three minutes was a pleasant surprise given the lack of training leading up to the race. To be honest, this was probably more pleasing a result than the half-marathon PB a month or so before. The race was over but the event…far from it. The goodie bags handed out at the castle were filled with Nestle, one of the race sponsors, chocolate – six Yorkie bars; four KitKats; an Aero and a Milky Bar. A great haul! The next job was to collect a finisher’s t-shirt before cracking open the complimentary bottle of water and taking in the picturesque surroundings and walking back through the village to the car park. This was my first experience of the Guy Fawkes 10 but it definitely won’t be the last. Remember, remember, the first Sunday in November.